Martha Elizabeth Jones was called home to be with the Lord on Saturday, November 24, 2018. She was born on July 28, 1928 to the late Jesse and Virginia Mondrey. 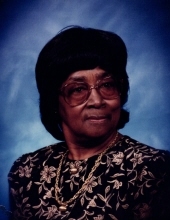 She attended Pleasant Grove Elementary School, which was right on this spot, and she graduated from Russell Grove High School in the class of 1947. Elizabeth was a hard worker and truly loved her family. She moved to New York to help her Uncle Joe and was there for many years. She had a passion for life and adventure. While in New York she kept a scrapbook of her exploits at Birdland and the Apollo Theatre and many other places. When she returned home, she became a teacher’s aide in the Richmond Public School System. Elizabeth accepted Christ at an early age at Pleasant Grove Baptist Church. While in New York her scrapbook showed the bulletins of various churches she attended. Her low alto voice used to ring out as she harmonized with the Pleasant Grove Church choir. But singing wasn’t her only gift. She loved sewing, crafting and decorating. Liz, or Aunt Liz, or Lizzie or Nanna as she was affectionally called also loved to dance, put the music on and her body would move. God blessed her with a zest for life and creativity. She never took a sewing class but could take a dress or coat apart alter it and put it together again. Elizabeth loved her family and kept pictures, bulletins and newspapers of their accomplishments, even handwritten notes to her, all to be put in her scrapbook. Elizabeth was preceded in death by four sisters, Charlotte Mondrey, Marjorie Perry, Jessie Mae Jackson, and Lucille Whitaker; three brothers, John Henry, Joseph Mondrey, and Jackie Turner. Those left to cherish her memory are, one daughter, Rev. Sylvia M King of Richmond, VA; two grandsons, Steven (Gail) King, Michael J. King; ten great grandchildren, Stacey, Marcus, Mykayla, Niaja, Milanna, Sadiyah, Gabriele, Armond, Ameir, and Macario; one sister, Rev. Marie (Thomas) Mickie of Richmond, VA; two brothers, Edward (Doris) Mondrey of Amelia, VA, Oliver (Nancy) Mondrey of Richmond, VA; sisters in law, Carrie Mondrey of Amelia, VA, Dorothy Turner of Richmond, VA; a devoted niece, Cynthia Fobbs of Richmond, VA; two special devoted friends, Sirena King of Richmond, VA, and Monica Carter of Richmond, VA; her best friend, Alma Foster of Richmond, VA; and a host of other relatives and friends. Funeral Service Saturday, December 1, 2018 at 1:00 pm at Pleasant Grove Baptist Church, Amelia. Interment church cemetery. Michael W. Hawkes Funeral Home of Amelia in charge of arrangements. To plant a tree in memory of Martha Elizabeth Jones, please visit our Tribute Store. "Email Address" would like to share the life celebration of Martha Elizabeth Jones. Click on the "link" to go to share a favorite memory or leave a condolence message for the family.